The assignment is internal to the company's design team. Led by Daniel García Sanchez. 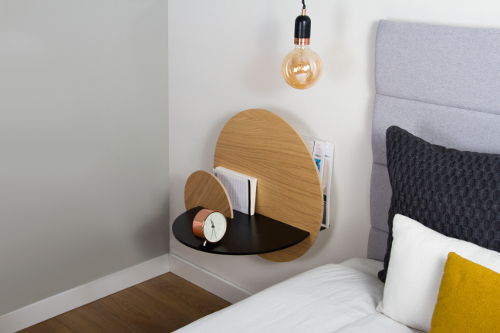 In the industry we have many bedside tables, with legs and drawers. Some higher, others lower, some have more drawers, other less. From Woodendot's design studio, we feel that we should make the products original, so we thought about changing the operation of the traditional use of drawers. Thus, the result we have obtained is a very clean product visually, with character and functionality. As for the formal construction, the rear panels have a horizontal slot that allows positioning it on a steel structure that is screwed to the wall. Similarly, the table top has another slot that allows the small front panel to fit, allowing the hiding of small objects. In addition, we have incorporated a hole that is also hidden so that cables can pass to charge devices such as the Smartphone. Since we are working with the company from the very beginning, our knowledge of it is enormous, which means that we can focus and direct the design where the company wants. When designing new products we always think about how to provide some extra functionality that seemingly is not very perceptible. The idea is to get beautiful and simple products, but also very functional. 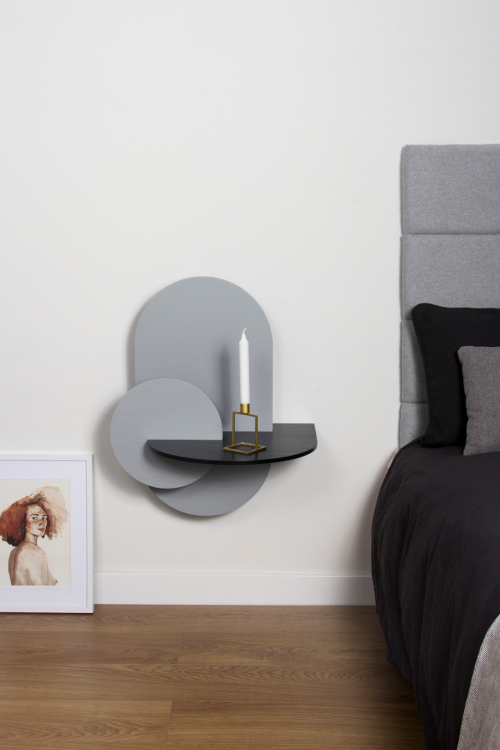 We have applied this same principle to other collections such as the storage tables called BATEA or the wall shelves with hidden hooks called PELICAN. 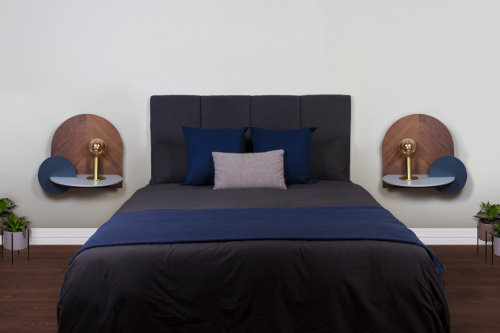 This time we have created a modular system of bedside tables that have hidden storage. They have a small front panel that serves to hide small objects and a much larger one on the back, to store large objects such as books, tablets, etc. Being a modular system, each person can set theirs. We have worked a lot on the design of each panel so that they can be interchangeable, thus we can offer more than 10,000 variables with a few shapes and finishes. There was a moment in the design process where we realized that what we were creating was very beautiful and that we could optimize it to use the product in the rest of the home space. 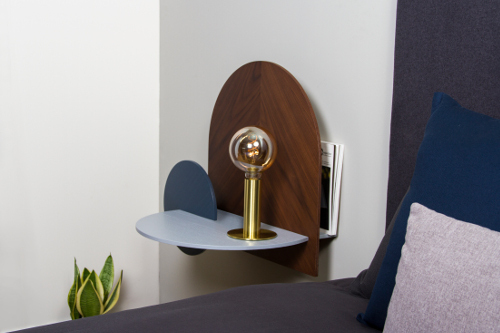 Also, we decided to design a narrow shelf to give another function to the product, thus we can distinguish between the ALBA bedside table and ALBA wall shelf. 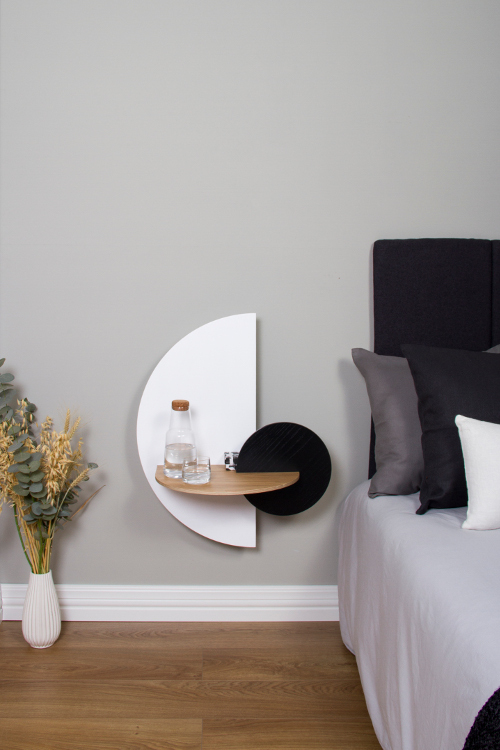 In the latter case, the rear panel is attached to the wall and does not have storage for large objects, the product becomes a wall shelf with hidden storage for small objects. 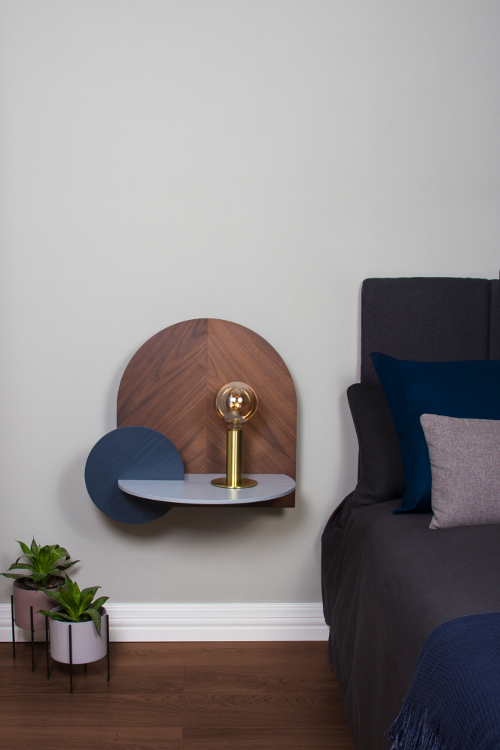 I think it's original because it's a bedside table that has no legs, but in turn is configurable by the user in a lot of shapes and colors. 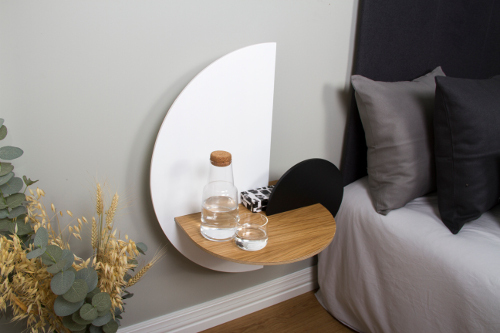 In addition, it is practical with its storage, simple and elegant ... We believe that there are no more modular bedside tables like this one.